Polygonal flagstone is an excellent choice for cladding walkways, courtyards or terraces. 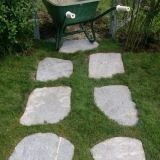 Available in many creative shapes, this polygonal flagstone has a particular cut out, also called “crazy paving”. You can choose from a broad range of colors, random surface size and relatively constant thickness (approx. 5 cm). Polygonal flagstone is sustainable and durable (against fire, freeze and erosion) and it can also be used for cladding fences or facades of buildings, for an efficient look of the exterior. Choose polygonal flagstone with darker shades if you want a living space with active look. Here are some recommendations for your decoration project. Red Vidin Polygonal Sandstone has fresh and vivid color, in lovely contrast with garden plants or the freshly mowed lawn. It is better accentuated when other design elements (uncladded vertical areas) are for example, white, because red sandstone creates a friendly and relaxing atmosphere. Another interesting solution is polygonal flagstone Decor Stone Yellow. In this case, the bright beige shades of stone are a perfect fit for rustic tones in any exterior decoration concept. The same stone can be used for a different exterior cladding – home base of building (details in the image below). 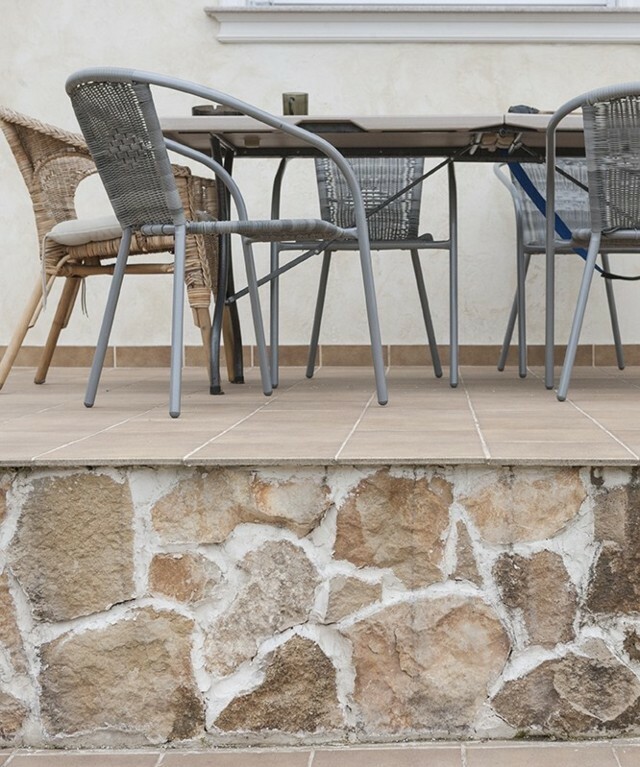 Kavala Polygonal Tumble Slate (also available as patio flagstone slabs) accentuate the basic color of stone, with maximum effect and carefully imagined combinations. Below, you can find an example. If you’re planning to remodel your garden or courtyard, another solution is Sikis polygonal slate. Besides special durability, metallic hues with blue tones will convey a unique touch to the exterior space. 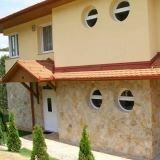 We recommend choosing the same stone for your exterior decoration project, perhaps with different finishes. 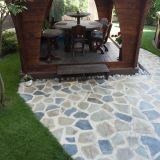 Polygonal flagstone has a strong visual impact and if you use two or three different stones it only clutters the design. Exterior decoration projects have similar rules and risks, so avoid cluttering the space with excessive textures, material and decorative objects, if you want to enjoy a relaxing space. A good example is the image below (project by one of PIATRAONLINE customers) with same material used for cladding courtyard, home base of building and adjacent walkway. Next image presents another example for using polygonal flagstone in the exterior: Macedonia Cream Polygonal Limestone, medium size, used for terrace wall cladding. Stone chosen for flooring (classic travertine) has the same shades. For further details on choosing the stone best suited to your decoration project (courtyard, terrace or garden) call us at + 40318 222 333 or better visit our showroom to discuss more!